At an 11 a.m. press conference held Thursday at Dos Pueblos High School, County Fire Chief Eric Peterson called the Scherpa Fire “a significant and challenging fire with fuels that haven’t burned in more than 70 years.” The area, known to locals as “La Scherpa,” continues to burn 1,200 acres at zero percent containment. “It’s getting bigger as we speak,” said Peterson. By 1 p.m. Thursday, the fire was burning a quarter mile from Highway 101 near Refugio Campground. People at Refugio Campground and El Capitan’s Ocean Mesa Campground were being told to leave. According to Sheriff Bill Brown, 427 emergency phone calls were made to at-risk residences and businesses. Of those calls, 395 announced mandatory evacuations. Forty-one evacuees spent Thursday night at the 200 North Turnpike Road Wake Center. All but three of them camped outside the building in their own trailers. Refugio, Venadito, El Capitan, and Las Flores canyons are still under order to evacuate. Residents of Dos Pueblos, Eagle, and Las Llagas canyons have been warned to evacuate. Refugio and El Capitan state parks, which cancelled all reservations through June 24, are closed. Based on reservations at two state beach and private campgrounds, over 1,000 people have been asked to evacuate. Eighty-three horses — 50 from Circle Bar B Ranch — were shuttled to Earl Warren Showgrounds. For help with animals, residents should call the county’s Animal Services at (805) 681-4332. With little fire activity in the state currently, resources remain focused on the Scherpa Fire, CAL FIRE Unit Chief Scott Jalbert told reporters. 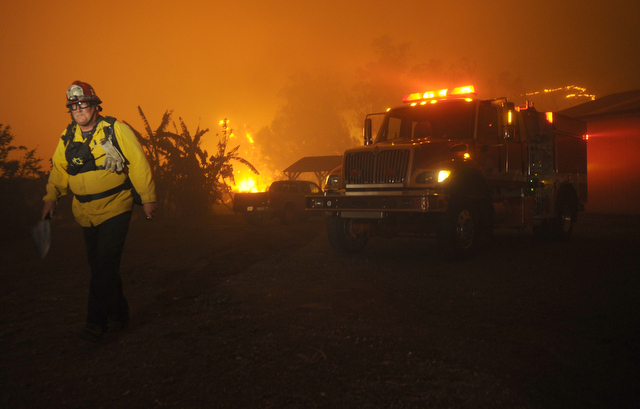 The U.S. Forest Service, CAL FIRE, and Santa Barbara County Fire have formed unified command. Firefighters from the City of Santa Barbara, Montecito, Carpinteria/Summerland, Santa Maria, and Lompoc, as well as from San Luis Obispo and Ventura counties, are fighting the flames. Fire officials are concerned about a massive heatwave heading to the southwest in the coming days. Of ExxonMobil’s Las Flores oil refinery, Peterson said, “Last night the fire bumped [into] one of the oil facilities.” Last night, defensible space around the refinery “paid off,” allowing firefighters to protect it. “We are all putting in tremendous effort to keep this fire in its box,” said Peterson. “All that can be done at this point is being done.” The county opened its Emergency Operations Center at 4408 Cathedral Oaks Road at 10:37 p.m. Wednesday night. Currently, the fire’s western edge is at Refugio Road, and its eastern edge is Las Flores Canyon. Forest Service officials said the goal is to keep the blaze — which started at nearly the top of the mountains near the Refugio Pass — north of Highway 101, south of West Camino Cielo, west of Gato Canyon, and east of Tajiguas Canyon. Tonight’s forecast includes winds of 25-35 mph with gusts up to 50 mph in the Refugio area. Sixty structures are considered threatened, but none have been damaged. No injuries have been reported.